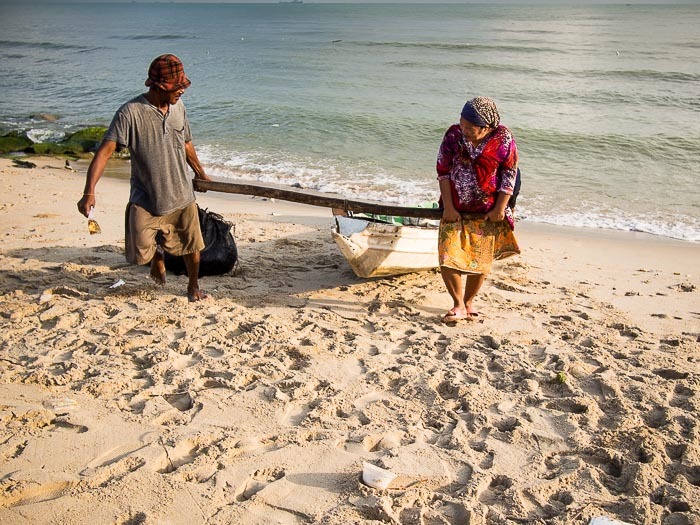 A fisherman and his wife pull his boat (which is more of a canoe really) up the beach in Kao Seng. Kao Seng is a small village on the edge of Songkhla, the provincial capital of Songkhla province. Most of the people who live in Kao Seng are Muslims. The village is so small and blends so seamlessly into the town of Songkhla it doesn't even merit a spot on the map. Anyone who complains about the price of seafood should visit a place like Kao Seng. The fishermen go out very early in the morning, just after midnight, in tiny open boats to harvest what they can from the sea. They stay out for 10 - 12 hours before returning to shore to offload their catch. 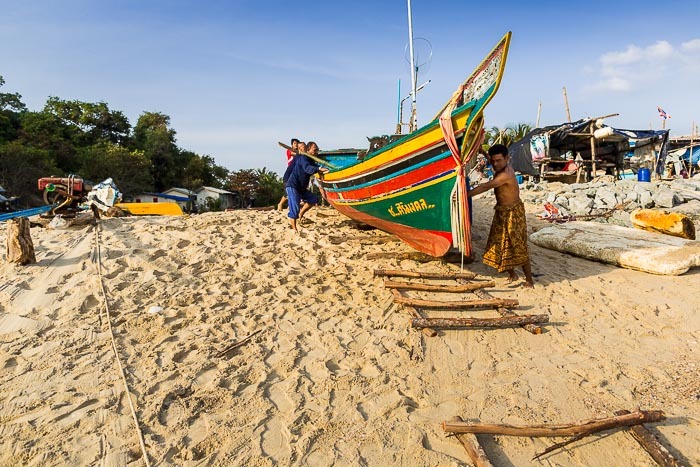 During the rainy season or storms, they spend their time on shore, repairing their nets or fishing in the surf. They sell their haul just off the beach. Most of the people who buy the catch of Kao Seng's fishermen are market vendors from Songkhla or Hat Yai, about 30 minutes away. A fish sold by the fisherman for 150Baht ($5US) gets sold in the market later the same day for 300B and in a restaurant might be 500 or 600B (roughly 30B to the US Dollar). In a scene that is all too depressingly familiar to farmers, ranchers and fishermen around the world, the fishermen, who undoubtably do the hardest part of the work, net the smallest amount of money. Members of the community come together to push a neighbor's boat to the sea.